Description: This concert handbill is one of the oldest pieces of Dr. Strange memorabilia. It was created 4 years after Stan Lee and Steve Ditko first introduced Dr. Strange. 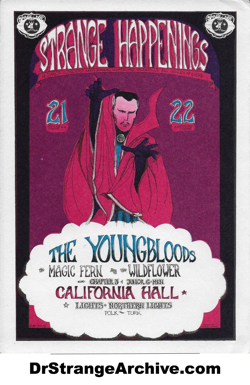 The image is by Greg Irons and was created for a concert featuring The Youngbloods with Magic Fern and Wildflower at the California Hall in San Francisco July 21 - 22, 1967. Other bands are listed as well as the title Strange Happenings. Under the main title, is written - a dance concert with bands, lights and vaudeville all giggly & wierd. Dr. Strange is featured predominately in the center of the image. A poster (14inch x 20 1/2inch) was also created for this concert and is extremely rare. The handbill is 5 x 7 and the image is 4 3/8 x 6 1/2. 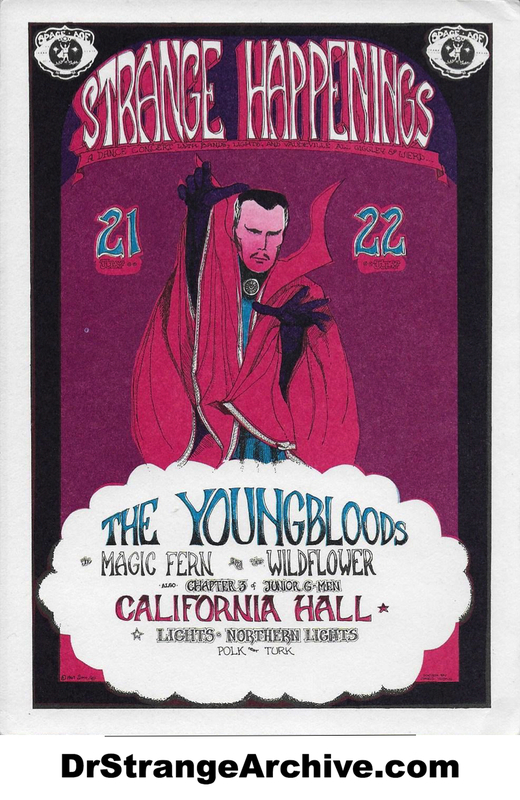 Youngbloods was an American rock band. Greg Irons was a poster artist, underground cartoonist, animator and tattoo artist who died in 1984. He also did album artwork and worked on the film Yellow Submarine. This is one of my favorite items in the archive because of its age and the history of the artist.